There are nights where I lie in bed, staring up at the ceiling and I ask for help. 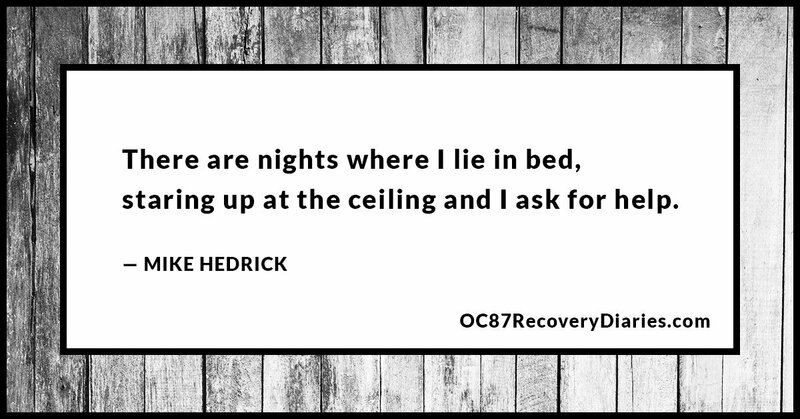 Sometimes the voice comes; sometimes it doesn’t but, in the times where it does, it gives me the reassurance that I need to, at the very least, make it through the night, and then to keep going the next morning. I talked, in my previous essay, about the mysterious voices in my head and the God voice is one of the two distinct voices I hear. The other is some kind of demon that I’ve talked at length about in my other writings, but the voice of God, as omnipotent and wise as it is, is still a symptom of my psychosis. This voice of God is not real. It is a function of my illness. It is, in effect, my conscience and to assign the label of God to it may well be shortsighted. It is a voice that I hear that guides me and reassures me and, in that case, it may as well just be an internal advisor. There are other times, when I’m sitting at my desk working or when I’m at a coffee shop, where I feel the weight of the world on my shoulders and I’ll say a quick prayer and the voice will reassure me. 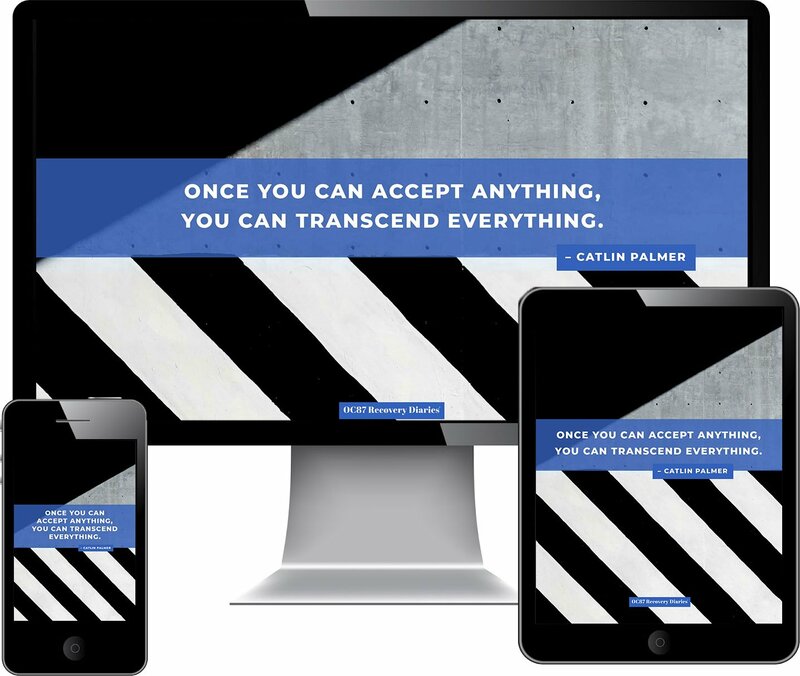 In one such instance, I was sitting in front of my computer, bored and sad and I said, “Lord, give me peace.” A distinct voice then said “Relax.” It’s not as if I hear that voice audibly, it’s more like a word is somehow implanted in my mind, as if it’s some sort of telepathy. I wouldn’t explain it that way if I knew that it came from me but, for all intents and purposes, it seems to appear out of nowhere. I talk to this voice often. I thank it for the circumstances in which I find myself, both good and bad, because I know that the bad stuff only serves to help me grow. I find, though, that I do try to speak to God, or the voice, or whatever ethereal essence there is in the universe, more when I’m having difficulty. It’s almost a stress response to say a short prayer. In those times, I may not hear any voice, but I feel calmness. That’s all I need. My prayers run the gamut of thanking God to asking for help, to normal, everyday conversation where I find that I don’t have to say a lot because, if God is omnipotent, he knows what’s happening. If this God, or this voice, too, is just some mechanism of my brain chemistry, it still knows what’s going on in my head. It’s hard not to assign some meaning to the voice, it’s hard not to anthropomorphize the thoughts in my head into some kind of sentient being and I find that I do that pretty automatically. It helps, though. There are instances where it knows what to do and where it has better advice that I somehow was unable to come up with myself. I can recall a moment where I asked for help about whether or not to take on another writing job and it said, “Give it time.” It was a good thing I asked because had I taken on that writing job I would’ve probably fallen into a psychotic episode. There would’ve been too much stress and I inevitably would have had too hard a time dealing with the numerous demands on my time and my mental and emotional capacity. The voice helps with a lot of things, it helps with my work, it helps with relationships and it helps me maintain control of my tenuous balance of stability. It calms me down when I’m anxious and when I need encouragement. I can remember a night where I was pretty seriously depressed and had even gone to the lengths of looking up how to buy a gun.That night, I asked for help and it told me I was doing great, that I just needed to hang on and relax. The voice, as chemicals in my brain, got me through to the morning when I was able to tell my parents about what had happened. They then took steps to get me the help that I needed. This included scheduling the next available appointment with my psychiatrist to change my meds and getting an appointment with a new therapist to talk things over. I’ve had a slightly religious bent for a long time and it’s a quiet kind of faith. I don’t go to church and I don’t believe in a Hell or Heaven but I believe there’s something that created us. I keep this religion to myself. It’s intensely private and I don’t espouse the benefits of my faith to people because I know that they’d dismiss me or call me crazy, but I have a relationship with God or the universe or the ether or whatever you want to call it. There are passages in the bible that have comforted me, and there are passages that I think are misguided but I believe that the good in the world, the benevolence of a rational mankind, is guided by something and that’s the thing I believe in. I don’t know what combination of brain chemistry is taking place in order for me to hear or telepathically receive this calm voice in my head when I need it. It may just be some long buried unconscious mechanism that’s telling me what to do, but I do feel that it is somehow separate from me and the mind-body unit that I feel represents Mike Hedrick. It’s as if it comes when I need it and is quiet the rest of the time. It knows when I need to hear something good. It’s strange, and might be disconcerting to someone else, but it gives me comfort. I’m well aware of the danger of talking about the voice of God in your head. I’ve read books about Joseph Smith and L. Ron Hubbard and others who claimed some divine authority from their supposed interactions with a force greater than themselves. 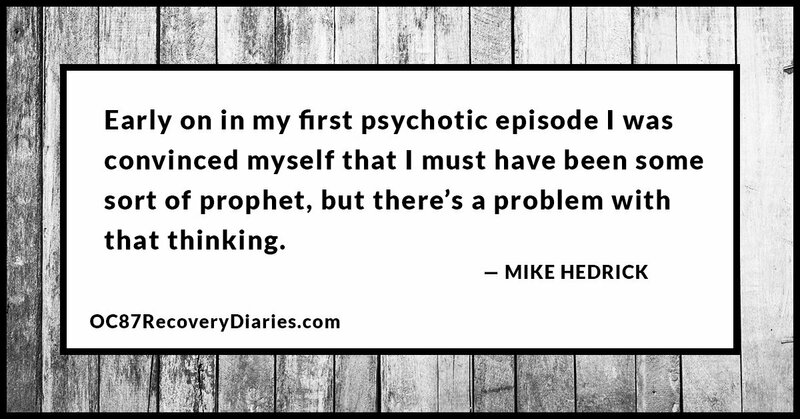 Early on in my first psychotic episode I was convinced myself that I must have been some sort of prophet, but there’s a problem with that thinking. Believing things like that gives you a complex where you feel like you’re set apart from the rest of mankind, you feel as if you’re somehow more special or gifted to be receiving this voice. I don’t even know for sure if this voice is just my conscience, something which each and every one of us has to some degree. Claiming you hear the voice of God is like saying you were somehow bestowed with a gift that makes you worthy of praise. Other more unstable people may take advantage of something like that and create some kind of cult or religion around their supposed abilities but that’s not me, I’m not even sure it is a special ability and for me to think otherwise would be dangerous. I’ve even asked the voice of God if it was God and it remained suspiciously silent. It’s my impression that those who’ve claimed to be prophets had some undiagnosed form of psychosis where they had delusions of grandeur that led them to believe that they were sent by God as a messenger to Earth. I’m well aware that I have psychosis and delusions of grandeur and that the voices I hear in my head, both God and the demon, are there because I have a mental illness. They are some function of my internal processing that got disconnected from my conscious awareness and are now seemingly speaking on their own. I am ill and I know this. I know that the voices I hear are not divine and I know that they come from me. Studies have even show that, when people in my situation hear voices, their own vocal chords are modulating. 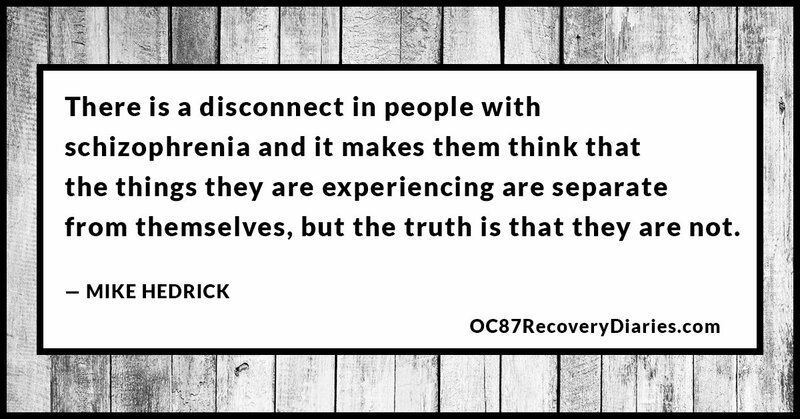 There is a disconnect in people with schizophrenia and it makes them think that the things they are experiencing are separate from themselves, but the truth is that they are not. They are reacting to things that are happening in their brain chemistry, whether they realize it or not. 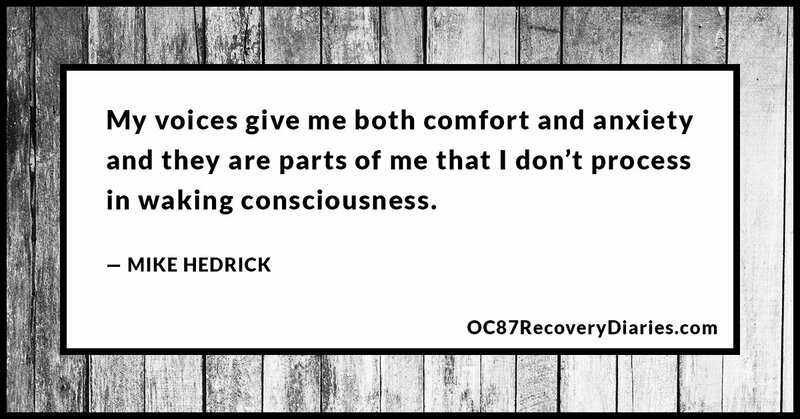 My voices give me both comfort and anxiety and they are parts of me that I don’t process in waking consciousness. They are the best and worst versions of me, paired into things that seem to come out of nowhere. They are the voices everyone has in their heads, telling them they’re not good enough and that they need to relax but, when you have schizophrenia, you lose the realization that these voices are part of you. That’s the best and only way I can describe it. 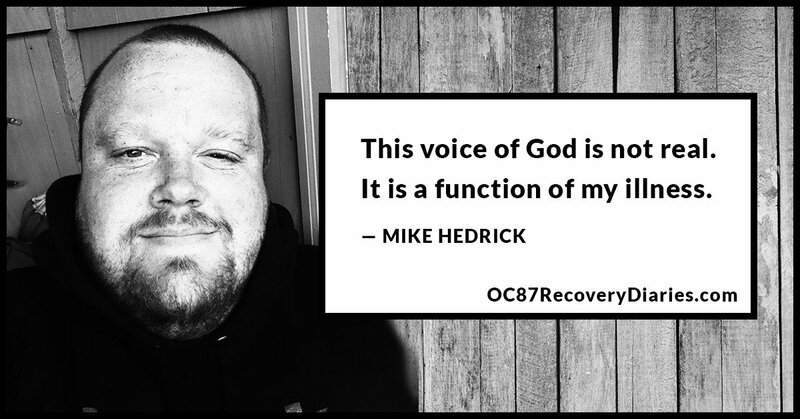 I know that these voices aren’t real and I know that I don’t actually hear the voice of God but, when I’m having a hard time, they are there and they either help or hinder. These voices are there, though, and that’s ok. I live with them, God in my mind and the devil on my shoulder and, by now, I’m used to it.